WELL, well! 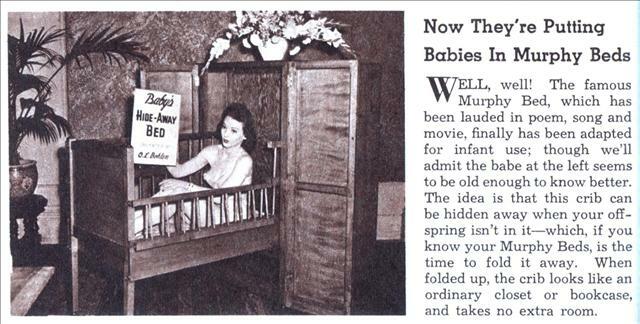 The famous Murphy Bed, which has been lauded in poem, song and movie, finally has been adapted for infant use; though we’ll admit the babe at the left seems to be old enough to know better. The idea is that this crib can be hidden away when your offspring isn’t in it—which, if you know your Murphy Beds, is the time to fold it away. When folded up, the crib looks like an ordinary closet or bookcase, and takes no extra room.